Since 2012, Crossfields Institute have co-organised a series of conferences in collaboration with the Institute for Philosophy and Aesthetics at Alanus University (Bonn, Germany). For each conference, a third partner has also been invited in to co-design, co-organise and co-host the conference. Past conferences were organised with the University of Kent and the University of Gloucestershire. The most recent was the Leadership, Ethics and Working with Unknowing conference which took place March 2017. This was organised in collaboration with University of the West of England’s Leadership Centre (Bristol Business School). Crossfields Institute is interested in re-thinking higher education and exploring ways that academic learning can serve the real cultural and spiritual needs of our time, as well as the purely economic. Part of the aim with these conferences is to make links with institutions, departments and individuals who share this interest. Each conference is focused on a specific theme, but the aim is to invite contributions that break narrow disciplinary boundaries. Alongside conventional presentation formats, such as keynotes, paper sessions and workshops, the conferences also welcome contributions that take a more embodied and interactive approach. The aim here is to promote lively debate about the structure and form of academic learning, and the responsibility of higher education to widen horizons rather than narrow them. Ultimately these conferences aim to be free and open spaces for deep learning and stimulating debate. They are aimed at academics, practitioners and students and anyone else interested in the subjects explored. Our last conference is organised in collaboration with the Institute for Leadership and Sustainability (IFLAS) at University of Cumbria. Details of this and other past conferences can be seen below. The Poetics of Leadership: Creativity, art and story in enabling meaningful change. 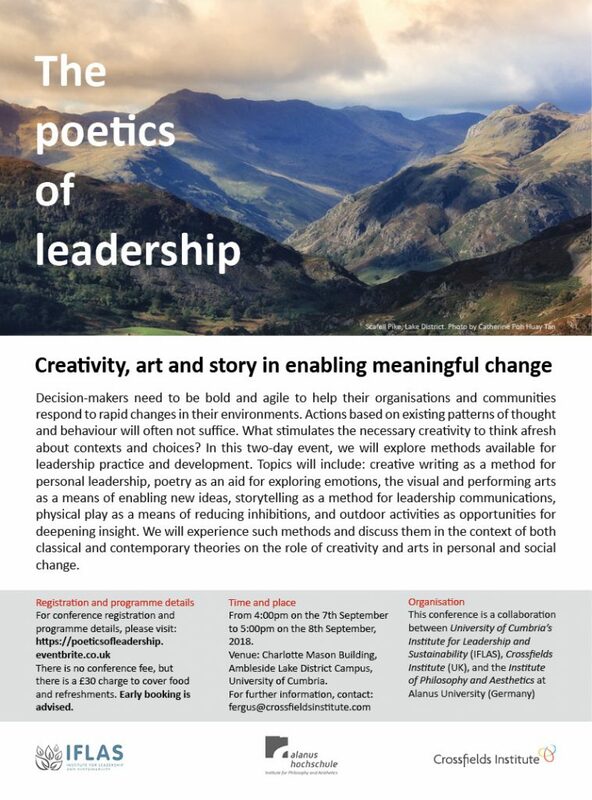 A conference for researchers, educators and practitioners in leadership development, drawing inspiration from the beautiful Lake District National Park. Charlotte Mason Building, Ambleside Lake District Campus, University of Cumbria. 7th September 2018, beginning at 4:00 pm, to 8th September 2018, ending at 5:00 pm. 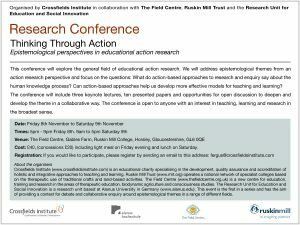 Organised by Crossfields Institute, University of Cumbria’s Institute for Leadership and Sustainability (IFLAS) and Alanus University’s Institute of Philosophy and Aesthetics (Germany). 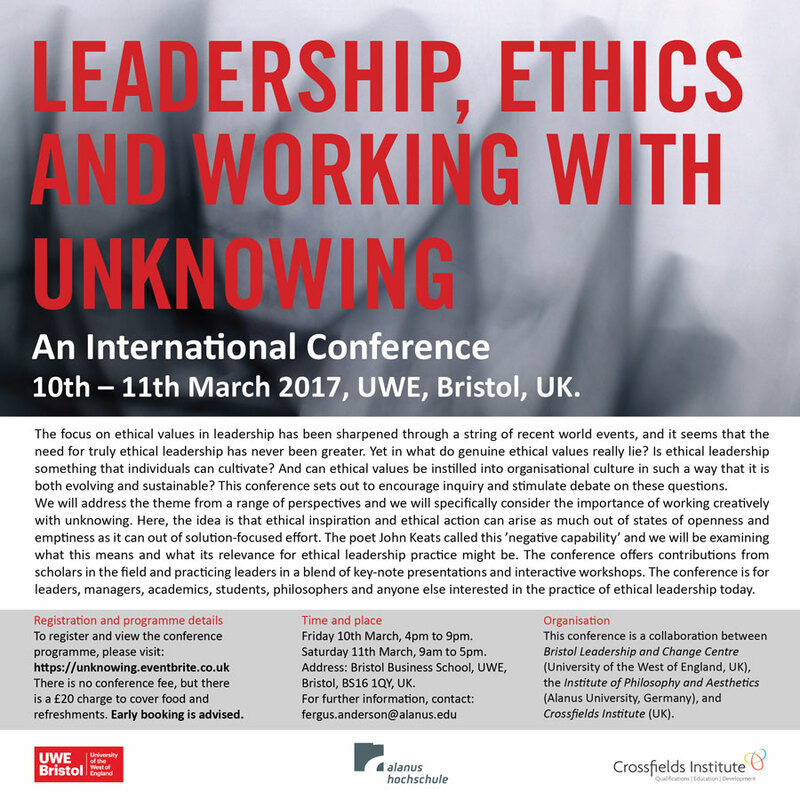 10th – 11th March 2017, UWE, Bristol, UK. The focus on ethical values in leadership has been sharpened through a string of recent world events, and it seems that the need for truly ethical leadership has never been greater. Yet in what do genuine ethical values really lie? Is ethical leadership something that individuals can cultivate? And can ethical values be instilled into organisational culture in such a way that it is both evolving and sustainable? This conference sets out to encourage inquiry and stimulate debate on these questions. We will address the theme from a range of perspectives and we will specifically consider the importance of working creatively with unknowing. Here, the idea is that ethical inspiration and ethical action can arise as much out of states of openness and emptiness as it can out of solution-focused effort. The poet John Keats called this ’negative capability’ and we will be examining what this means and what its relevance for ethical leadership practice might be. The conference offers contributions from scholars in the field and practicing leaders in a blend of key-note presentations and interactive workshops. The conference is for leaders, managers, academics, students, philosophers and anyone else interested in the practice of ethical leadership today. Thinking is deeply embedded into every aspect of human life. It informs how we experience ourselves and it informs how we experience the world. It also plays a major role in determining the kind of social, cultural and technological environments we collectively create. And yet for all its importance, there is still little general consensus about what thinking is or how it functions. Cognitive science has tended to reduce thinking to ‚outer‘ physical factors. Traditionally this has been understood as computation-like activity in the physical brain, but more recently it is seen as the activity of the brain and body in living interaction with the physical environment. Other approaches to thinking focus on how we use words and how language is structured. Still other approaches adopt first-person and phenomenological methods to describe the conscious experience of thinking from the ‚inside‘. At this conference we will address the question of the nature of thinking from both outer and inner dimensions. There will be keynote lectures, workshops and paper presentations that draw from different disciplines, including philosophy, phenomenology, psychology, the arts and neuroscience. The aim is that out of this transdisciplinary approach, new insights emerge that go across and beyond the different disciplines. The conference is for academics, researchers, educators and students from any discipline who are interested in deepening their understanding of what thinking is and how it functions. International conference, 29th and 30th May, 2015. Venue: Alanus University of the Arts and Social Sciences, Alfter, Germany. With career pathways and employability increasingly defining higher education, what is the role and importance of subjects such as literature, philosophy and the arts? And is there still a place in higher education for pursuing a love of learning for its own sake? In this conference we will explore the possibility of higher education as a journey into the unknown, a place, perhaps, for finding an individual calling or life’s task, a place for self-discovery and selftransformation, a place for exploring questions of human experience and human existence. What is the relevance of this notion of higher education today, both at the individual level of spiritual meaning and fulfilment and at the more general level of social cohesion and resilience? 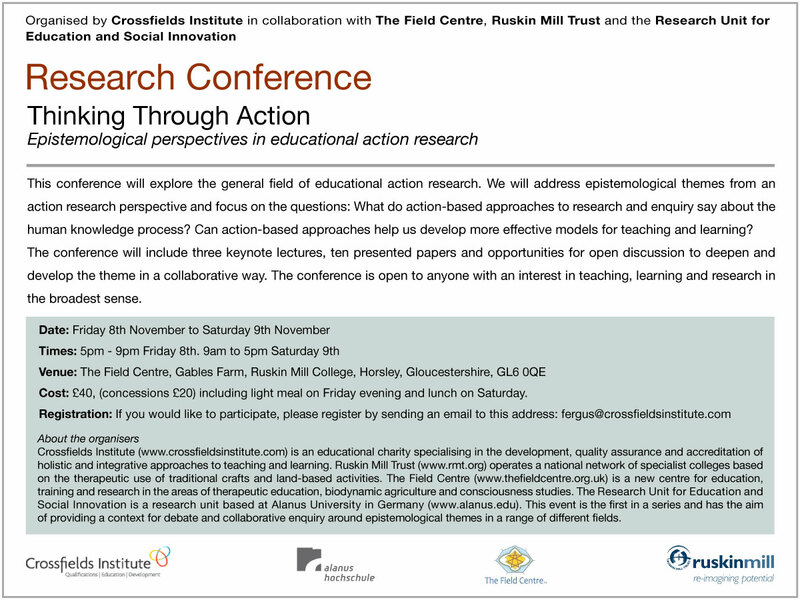 Our aim for this conference is to create an open space for collaborative dialogue, creative thinking and critical enquiry, with the hope that this will promote new insights for practical ways forward. The conference is for educators, practitioners, students, researchers and anyone interested in the future of higher education. 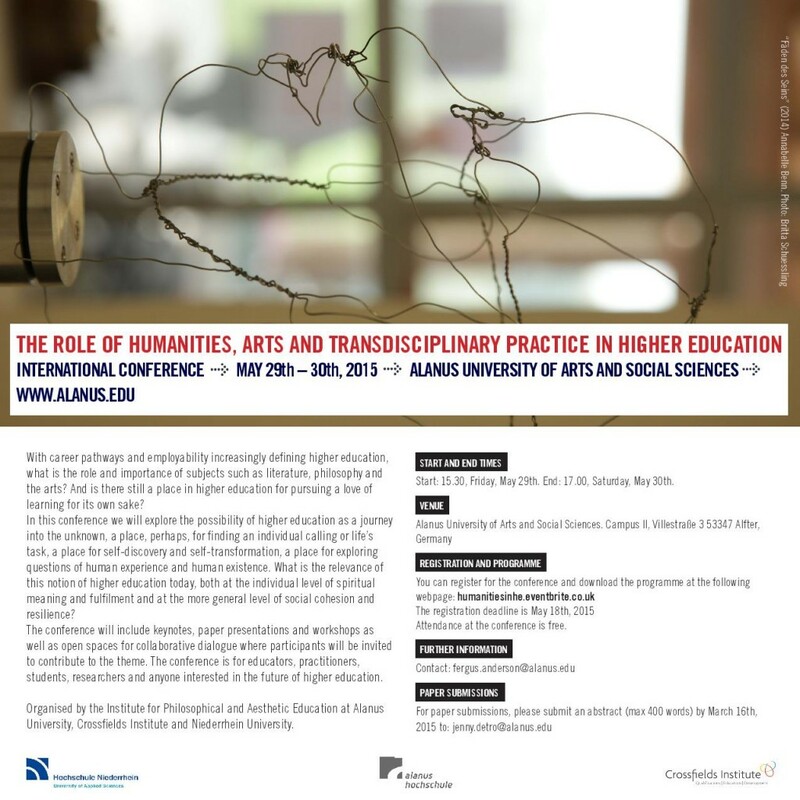 The conference will be held at the Alanus University of Arts and Social Sciences in Alfter, Germany, which is a short train journey from Bonn/Cologne airport. The start and end times of the conference are: 15.30 on Friday 29th May to 17.00 on Saturday 30th May. This conference is organised by the Institute for Philosophical and Aesthetic Education, Alanus University of Arts and Social Science, Crossfields Institute and Niederrhein University of Applied Science. What were the original ideals of the university and how do they relate to what the university has become today? How can new ideas of ethical, embodied transformative practice help to reimagine and revitalize the university? embodied teaching and learning methods that involve the whole human being in the learning process. participatory learning that challenges and redefines how valid knowledge is created. learning that helps students develop into the ethical leaders of the future. inter-disciplinary practice that bridges the divide between arts, humanities and sciences as a way of opening up new approaches to learning and knowledge. This is a call for papers and save-the-date alert for an Early Years and Social Pedagogy symposium organized by Alanus University of Arts and Social Sciences and the University of Applied Sciences of Mönchengladbach, in cooperation with Crossfields Institute. The event will begin at approx 5pm on the 13th June 2014, and will end on the evening of the 14th June. The venue will be the Alanus campus in Alfter, Villestrasse 3, Germany (www.alanus.edu). The main language is English. Both universities are running BA courses in early childhood education and are keen to explore fresh research perspectives in dialogue with early childhood training programs in the UK. The general aim of the symposium is to nurture constructive dialogue and exchange between different approaches in early years education and social pedagogy. This includes for example Montessori, Steiner, Pickler and ‘mainstream’ approaches. 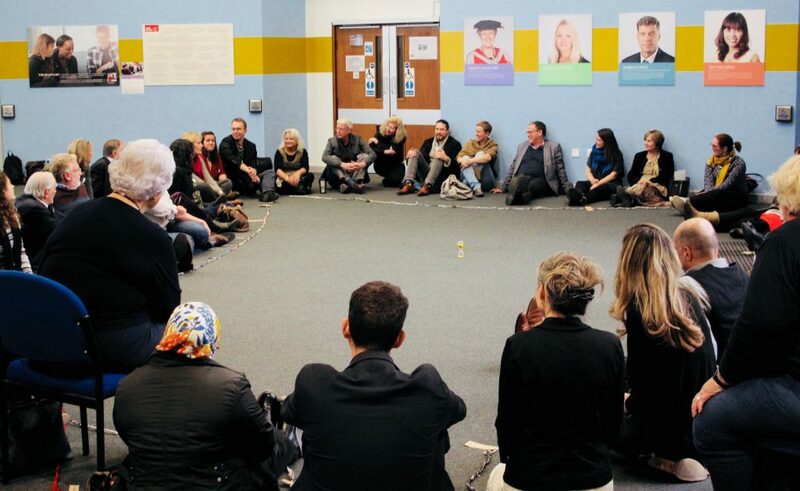 The question behind the symposium is how more dialogue and exchange between the different approaches can help to deepen understanding and practice in the critical early years field as well as in social pedagogy. Prof. Dr. Marcelo da Veiga and Prof. Dr. Janne Fengler from Alanus University of Arts and Social Sciences, Alfter (near Bonn), Germany. Prof. Dr. Peter Schäfer from Hochschule Niederrhein, University of Applied Sciences, Faculty of Applied Social Sciences, Mönchengladbach, Germany. In cooperation with Crossfields Institute, Stroud, UK.